Posted by Miguel Grinberg under Programming, Python, IoT. Welcome to my MicroPython and the Internet of Things tutorial! In this first part I want to give you a brief overview of what this tutorial is about, and more importantly, provide you the list of components that you are going to need. Posted by Miguel Grinberg under MicroPython, Python, Programming, IoT. I'm happy to announce a new multi-part tutorial that I will soon begin publishing on this blog and several other platforms. 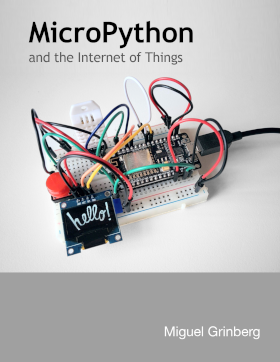 The tutorial is titled MicroPython and the Internet of Things and is a beginner tutorial that will introduce you to the exciting world of microcontrollers and small-form Internet enabled devices. Posted by Miguel Grinberg under Python, Flask. When you deploy your application on a server, you need to make sure the application runs uninterrupted. If the application crashes, you'd want it to automatically restart, and if the server experiences a power outage, you'd want the application to start immediately once power is restored. Basically what you need is something that keeps an eye on the application and restarts it if it ever finds that it isn't running anymore. In previous tutorials, I showed you how to implement this using supervisord, which is a third party utility written in Python. Today I'm going to show you a similar solution based on systemd, which is a native component in many Linux distributions including Debian derivatives such as Ubuntu and RedHat derivatives such as Fedora and CentOS. Posted by Miguel Grinberg under Database, Python. One of the most rewarding aspects of having a popular course online is that from time to time I get a question that forces me to learn something new. The other day a reader asked me how they can write a database query with an unusual ordering, and I had to stop for a minute (okay, it was more like half an hour) to think about how to do it within the context of a Flask and Flask-SQLAlchemy application. Are you ready to see some advanced SQLAlchemy action? Posted by Miguel Grinberg under Flask, Python, Programming. One of the useful features of my Flask-SocketIO extension is the test client, which allows you to write Socket.IO unit tests. A long time limitation of the test client was that it did not see cookies set by Flask, such as the user session. This complicated writing Socket.IO tests for applications that require authentication, because most authentication mechanisms write something to the user session or a custom cookie. The use case that caused pain to a lot of developers was applications that use Flask-Login combined with Flask-SocketIO. To unit test such an application you had to resort to weird tricks such as mocking the current_user variable. I recently came up with a solution to this problem, so I'm glad to report that this limitation is now a thing of the past. In this short article I want to show you how to set up your project to take advantage of the new cookie support in the Socket.IO test client. Posted by Miguel Grinberg under Python, Programming. For many types of applications, at times it is necessary to pause the running of the program until some external condition occurs. You may need to wait until another thread finishes, or maybe until a new file appears in a directory on disk that is being watched. In these and many other situations you will need to figure out a way to make your script wait, and this isn't as easy as it sounds if you want to do it properly! In this article I'm going to show you a few different ways to wait. I'm going to use Python for all the examples, but the concepts I'm going to present apply to all programming languages. Posted by Miguel Grinberg under Programming. It's been over a year since I wrote my guide on setting up a cheap Chromebook for web development. In that article, I presented three different ways to install a Linux distribution instead of, or sometimes alongside ChromeOS, the native Chromebook operating system. These three methods were all a bit hacky. One required running a heavily sandboxed Android app, while for the other two you had to put the machine in developer mode, which bypasses some of the security measures that make the Chromebook one of the most secure laptops you can find. Since I wrote that article in September 2017 there's been a new development. Now there is a fourth method of running a native Linux distribution, available to most Chromebook models from the last few years. What makes this new method interesting is that it is an officially supported feature of ChromeOS, so there is no need to activate developer mode, and no need to make concessions on the highly regarded Chromebook security model. This method is based on container technology, and is known by the project name Crostini. In this short article and video I want to give you a few tips on setting up a PyCharm project for your Flask application. The idea is to set up a Flask application so that it can be executed, debugged, and tested from inside PyCharm Community Edition, which is fantastic IDE for Python that is completely free to download and use. If you want to see me go through the exercise, watch the video below. Then you can come to the article if you want a quick reference and summary of the steps required.